Unfortunately, teaching English as a foreign language isn’t for everyone. Throughout your career you will find, as I have in mine, that there are many ways for teachers to prevent learning. Sometimes it’s because they don’t realise when they are holding students back, but it can also be through lack of planning or failure to respond to feedback on their lessons. Which is pretty unforgivable really. If you’ve ever done any kind of teacher training course, you’ll know that a huge bugbear of trainers, and something they rail against, is teachers talking too much. Filling the lesson with babble, unnecessary information, etc. They might feel nervous having a class of learners looking at, and expecting something from them. Given that many of us tend to talk our way through uncomfortable situations, nervous teachers often feel the need to fill the silence with their own voice. Cracking jokes, sharing personal experiences, or simply prolonging the explanation of something the students have already grasped. Lack of planning. If you don’t take the time to sit down and think about what you’re going to do in class, it’s difficult to know when the students should be listening to you and when you have to fade into the background, letting them do the legwork. Own learning experience. Most of us had this experience at school! A teacher standing at the front for an hour and explaining every little thing to us, in an often monotonous tone of voice. Therefore, we sometimes get the urge to apply the same method in our own teaching, mistake! A language lesson isn’t like school, the student’s should have the freedom to speak to you and to each other. The point is, that student’s need to be set free, so to speak. 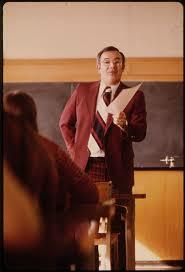 It’s sometimes necessary to explain things and do activities in which the teacher is speaking quite a lot. But the students should always feel like they can contribute. Our goal is to get them to want to do that, so we should take a step back from being the star of the show and let them get on with it. This may be uncomfortable in the first few classes, because students may be used to other learning styles, but eventually they will catch on to how you like it done. Students get more speaking practice and you don’t have a sore throat at the end of the year, everybody wins! In an ideal world, all the members of the same class would have exactly the same level, and respond to the same explanations, stimuli, and activities. Alas, this is hardly ever the case. A great way to spot an ineffective teacher is to see who doesn’t realise the differences between the learners in a group, and doesn’t take individual needs into account. You will very often find that one or perhaps two learners in a group will understand the subject material more quickly than the others. Try to remember that just because they have, doesn’t mean that everybody understands. You may need to adjust your examples, context, or explanation, so that it hits the right note with slower students. If you find the different levels in one group particularly disparate, you should always have the support of the director of studies, who will try to find a solution. Most learning centres these days will have textbooks in at least some of their lessons. Whether it be for official exam preparation, or just to give the classes some direction. A big mistake people make here, one I have seen many times and is detrimental to a successful course, is turning into a ‘textbook zombie’. To use the Cambridge textbooks as an example, they usually come with 120 hours of material. Which is fine if they are in it for the long haul and only to learn. But, depending where you teach, a huge percentage of learners will want to start and finish the course, passing the corresponding exam, all within 10 or 11 months. Do you have time to fit in 120 hours of just a textbook? No. An inefficient teacher will use the textbook as the class bible, taking everything it says as gospel. Don’t forget, if that’s what the students wanted, they could buy the book and do it themselves at home. They come to you so that you can make the coursebook less formulaic and dull. Have some fun with it! That said, always keep in mind the needs of your students. A good teacher will suss out the weaknesses of each group and individual learner, using this knowledge to tailor the coursebook and it’s plethora of information to each class. While it can sometimes feel intimidating, patronising, and / or demeaning to listen to your fellow teachers give you advice (perhaps if they have been teaching less time than you), sharing ideas and collaborating with your peers is essential. Observe each other’s classes, accept feedback, and ask for help when you need it. Otherwise, we get stuck in our ways, often with negative consequences for students. An inability to accept feedback from others is the hallmark of an ineffective teacher! Similarly, don’t forget to ask students what they think. If you have tried a new activity in class, ask them what they thought. If it was helpful, interesting, informative, or even fun! It doesn’t come across as a nervous teacher looking for validation, it comes across as a teacher that really cares about their learning and their English journey! A very good method for getting students motivated and interested, is making them laugh. Getting them to enjoy themselves while learning English is almost half the battle! But we have to be careful that this doesn’t end up in us stealing the show. You might be very funny and your antics might get lots of laughs and appreciation from your audience, but are they actually learning? I’d wager not. Make sure to keep a professional air around at all times, only clowning around when your’re sure that students will take something valuable from it. If not, you won’t feel like you have accomplished anything and they won’t thank you come exam time! Any I missed that you think I should add? Let me know in the comment section!